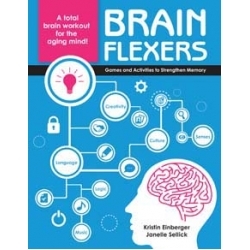 This mind-stimulating book offers tools and resources to strengthen mental functioning. Targeted brain fitness activities work to exercise many areas of cognition, such as memory, attention, focus, visual-spatial processing, and sequencing. These activities are fun—and appropriately challenging! And just like any good workout, the benefits increase the more you do! Organized by theme—Warm-ups, Sharpening Your Sense, Language, Geography, Creativity, History and Culture, Logic and Sequence, Music—each section comes equipped with ready-to-use worksheets of activities and corresponding answer sheets that include tips and advice for facilitators.